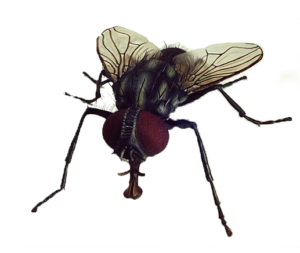 Using a professional fly control service is the most effective way to guarantee the complete removal of flies from your business. Exclusion – Proofing of doors, windows, roof vents, etc. to prevent flies entering a premises. Restriction – General good housekeeping practices to remove possible fly breeding sites. Destruction – Use of the correct fly control treatment for your individual circumstances. Monitoring – Inspection during regular visits. Clean an empty, plastic two-liter soda bottle. Carefully cut the top third of the bottle by cutting near where the top of the label used to be. Pour a sweet liquid, like sugar water, in the larger, bottom third of the bottle. Turn the top third of the bottle upside-down, making a cone shape, and place it in the opening of the larger part of the bottle. Flies will find their way into the bottle but will be unable to get out. Use a shallow dish bowl and fill it with an inch of apple cider vinegar and a tablespoon of sugar. Next, add some fruit-scented dish soap. You can leave the dish uncovered or tightly covered with plastic wrap. Make sure to poke a few holes in it to attract the flies.